Start your collection with this unique range of colours, available only from us! The best ever, most colourful collection of sempervivums, and a breeding breakthrough! A brand-new range of unique colours and only available from YouGarden. 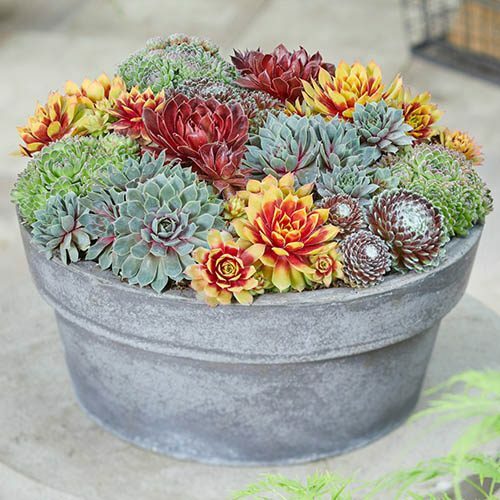 Year-round colour a superb way to start collecting these fully winter-hardy succulents. Ideal for busy home owners as they're easy to grow and require only minimal maintenance. Supplied as 6 different plants in 9cm pots. Sempervivums, the iconic houseleek, are making a welcome return to our gardens, as gardeners realise that they are a real multipurpose plant. However, these days, they're not just the old green things that populated parks and rockeries back in the seventies...there's a whole new range of colours to captivate and fascinate. Introducing Chick Charms® - a series of collectable Hens & Chicks plants, colourful hardy Sempervivums which are the perfect way to introduce an entirely new generation of kids and teenagers to the benefits that gardening can bring to our lives. These simple plants are ideal for any level of gardener; easy to grow and a doddle to maintain. Curated from five years of trials at the nursery of renowned sedum expert Chris Hansen, these collectable Chick Charms® each come with their own colourful, unique information tag, making them the horticultural version of a collectable charm bracelet. As Chris continues to add two to three new varieties to the series each year, gardeners will constantly be searching for the next Chick Charms® to complete their collection and this year's must-have has got to be the extraordinary 'Gold Nugget' with fiery orange tips to its golden yellow leaves - sure to be in demand, so don't miss out! Be part of this succulent revolution and buy yours now - let yourself be won over by these fascinating, low-maintenance perennials. Sempervivums form rosettes of colourful, fleshy leaves and are low growing, making them a welcome addition to any garden because of their colours and diversity of form. Also known as 'Hen and Chicks' because the freely produced offsets gather around the mother plant in much the same way as chicks around a mother hen. Sempervivums are drought tolerant and will take a roothold in the narrowest of cracks - hence their common name, as they were once used to plug gaps in leaking roofs. Really easy to grow and a favourite with kids, Sempervivums require a well-drained soil in full sun, tolerating drought when established. Please note that leaf colour is dependant on temperature and light, so may vary in intensity throughout the year. Plant individual varieties in a clay pot in gritty soil, top with small gravel and display each one on a sunny outside windowsill. Sempervivum plants prefer well-drained soil with sand or grit added. Grow them in trays or pots, in the ground, or on wood or in rock piles. Once established, the plants need no further care. Once a rosette flowers, it dies back so simply pull out the dead rosette and fill the hole with gritty soil. The plant will quickly fill in any empty spots with offsets.